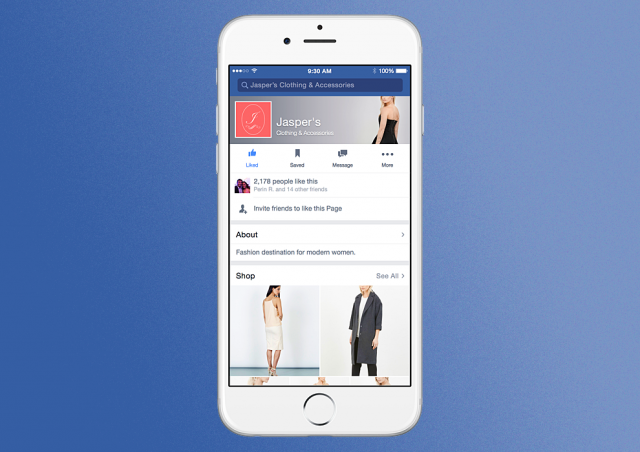 From Mashable: You’ll soon be able to buy a lot more stuff on Facebook. The social network is testing a shopping experience that allows users to buy items directly from business’ Facebook pages. The new shopping feature, first reported by BuzzFeed, will allow retailers to turn their Facebook pages into mini storefronts outside of their main websites. Facebook confirmed the new shopping features to Mashable Wednesday, saying it’s currently being tested among a small number of users and a handful of retail and e-commerce companies On mobile, the shopping features will appear in a new “shopping” section on the page, as pictured in the mockup image, below, while on desktop the shopping section will appear as a separate tab on the page in the same area where the Timeline, About, Photos and other tabs are currently located. In the shopping section, companies will show off products in a format that appears to be similar to the way photos are laid out. If you want to buy one of the products, the retailers will be able to choose whether the actual transaction will take place within Facebook or whether you’ll be redirected to the company’s website. For those that choose to keep the shopping experience inside Facebook, the checkout process will be very similar to the one already in place on Facebook ads that use the buy button. Facebook spokesperson Mike Manning said it’s too early to offer a timeline for when it will expand more broadly to include more retailers or be surfaced to more users. He declined to name the businesses participating in the initial test, but noted there are a range of different-sized retailers and e-commerce companies currently involved. The news comes as other social platforms are looking to increase engagement — and, eventually, revenue — with native shopping experiences. Pinterest rolled out buyable pins earlier this year, and Google announced Wednesday it would be experimenting with a “buy” button in its search results. Meanwhile Facebook has been increasingly experimenting with payments and shopping features. The company added peer-to-peer payments in Messenger earlier this year, and rolled out a business version of Facebook Messenger that allows customers to interact with businesses, including retailers. Recent reports have suggested the social network is also in the midst of testing a shopping assistant feature for Messenger. It doesn’t sound like Facebook plans to make money directly off shopping transactions for now, but all these new shopping and payment-related features fall in line with the company’s larger goal of keeping users in its apps and website as long as possible.